There are shades of vintage Chabrol in Jacques Deray’s 1969 psychological drama La Piscine, a tense but leisurely film starring French heartthrob Alain Delon, Romy Schneider and Maurice Ronet. Digitally restored, Deray’s thriller is once again set to be released on the big screen. A young, attractive, bourgeois couple are spending their summer vacation in an idyllic villa just outside St. Tropez. The two are quite content with their own company, happy to luxuriate beside the substantial swimming pool which acts as the focal point of this lavish rural getaway. The serenity is soon broken when Marianne (Schneider) invites her former lover Harry (Ronet) to visit, much to the annoyance of her boyfriend Jean-Paul (Delon). However, Harry is accompanied by his temptingly nubile, eighteen year old daughter Penelope (Jane Birkin) who Jean-Paul soon finds himself transfixed with. A series of awkward interludes soon sparks a chain reaction of infidelity, jealousy and eventually murder! La Piscine boasts some beautiful camera work, with every nook and cranny of this rustic countryside manor elegantly shot. The screen glistens like a pool and as the sunlight gleams off the shoulders of Deray’s bronzed stars there’s an almost voyeuristic feeling which comes from watching these strikingly beautiful actors stroll around in their swimsuits. Evoked through a collection of prying close-ups, this subtle injection of perverse surveillance only helps build the underlying tension that radiates from these awkward and erotically charged encounters. 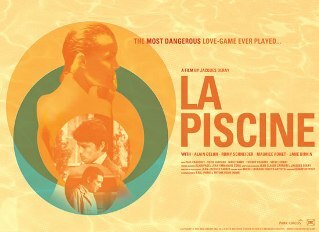 La Piscine’s calculated approach and lengthy runtime may become an insurmountable hindrance for many viewers. With little action taking place for the majority of the film, this slow boiling story is more of an insightful character study than a heart pounding thriller. Deray’s film, like its laid back cast, takes its time to soak up the atmosphere, instead placing its emphasis on the raw sensuality and subdued primal instincts which lurks beneath these seemingly innocent exchanges. A fine example of the passion which drives French cinema, La Piscine, whilst perhaps not as revolutionary as it peers makes for a delightful dose of French realism entwined with a pinch of observational suspense. Yet, it’s the calm and calculated way in which these events unfold which belies the true horror of this tale of murder and distrust.